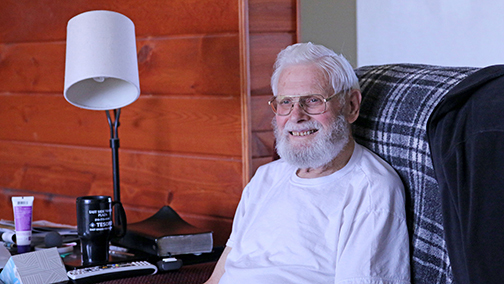 Hospice of the Red River Valley patient Bob Becker enjoys a quiet afternoon at home. A well-worn Bible lies within easy reach of Bob Becker’s recliner. The creased cover and dog-eared pages provide evidence of the many hours its owner’s hands have opened it. Each moment is increasingly important to Bob. While his faith has been a constant throughout his life, it and his family have become even more of focus since being diagnosed with cancer in 2011. It’s in the quiet, peaceful moments Bob spends with his Bible in hand that makes him feel most at home and like himself during an uncertain time. The Wyoming native is a charter member of Bible Baptist Church in Grand Forks. It celebrated its 50th anniversary in 2016. The hands that once built a church, and rebuilt it after the Red River flood of 1997, now flip through the pages of his Bible. It was a gift from his son and replaced the version Bob misplaced 12 years ago, the same year he lost his wife, Lucille. Bob met Lucille, fittingly, in a church in San Antonio, where he was stationed during part of his 22-year career in the U.S. Air Force. Eight months later they married. They spent four years in Germany before moving to Grand Forks. The couple raised two boys and two girls while Bob worked for the Air Force and another 22 years with UPS. Bob and his wedding photo. 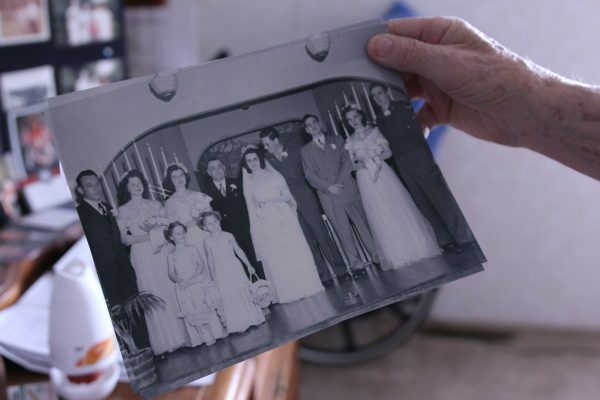 He and his wife, Lucille, were married 55 years. In 2007, Lucille, Bob’s wife of 55 years, died of pancreatic cancer. She spent the final week of her life under hospice care. Bob wishes they had explored it sooner for her because Lucille spent most of her final months going to and from the hospital from treatments before hospice care. Lucille’s death reinforced Bob’s belief in quality care at home when his own health took a turn for the worse. For Bob, that meant calling Hospice. Two years after going into remission from bladder cancer, the disease returned and spread throughout Bob’s abdomen. Chemotherapy treatments took their toll. Discontinuing treatment brought relief. Bob could simply focus on living well and spending valuable time with loved ones because Hospice of the Red River Valley is helping him along the way. Bob lives with his youngest son on three acres northwest of Grand Forks. The north-facing view is made up of mixed-grass prairie dotted with shrubs. Hawks patrol overhead. Bob explained that in the winter, it can be like living in a snow globe. Most important to Bob, this is home. Each week, Bob welcomes his hospice nurse, Judy Hendry, into his home. 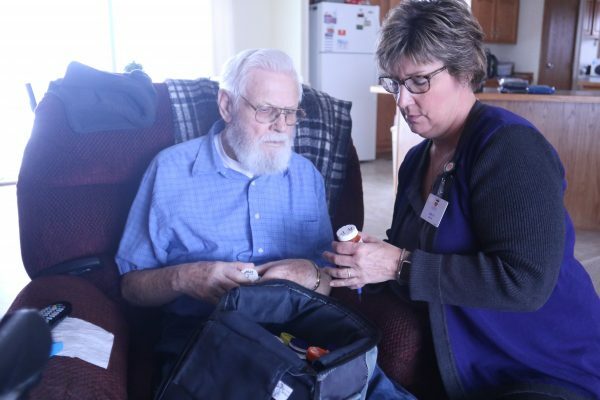 Bob and Judy Hendry, Hospice of the Red River Valley registered nurse, review medications. Their relationship is built on honesty and trust. A certified nursing assistant (CNA) and social worker also regularly visit. The small things add up for someone living at home. So when the CNA helps with household duties, like washing dishes or making the bed, it makes all the difference for Bob. Longtime Hospice of the Red River Valley volunteer Gilman Beck also stops by once a week from nearby Northwood, also home to one of Bob’s daughters. Bob reads from his Bible. The Hospice staff support allows Bob to maintain his independence, going out almost every day. He’s able to visit with his 15 grandchildren. Bob appreciates the Hospice team’s reliability. “When I get a call, I mark it on my calendar and they are always here when they say they will be,” he said. At the end of each visit, Judy and Bob take time to visit about life. Bob gives updates about his family. The ongoing support allows Bob to live his life exactly as he wishes, which includes spending time with family. Every evening, Bob has supper with his son and they follow it up with their favorite TV show, “Jeopardy!” “He gets more questions right,” Bob quipped. Bob’s certain he’s made the best decision for his end-of-life care in calling Hospice.